When Dan Sjolseth stares out at his shop floor at Superior Service Center in Eagan, Minn., he ignores the immaculately kept work spaces; he doesn’t notice the technicians bustling to complete work. His eyes instantly go to the idle vehicles, the jobs—in process—that are waiting for primer to dry and cure, or for body filler to set, or just plain waiting for the next phase of the repair process. FenderBender forecasted this trend for readers in early 2012 with a report on the basics of the technology provided at the time by Symach: The Future of Paint Drying. That’s a word Sjolseth despises; this coming from the owner of a shop with a four-day average cycle time and that pushes 125–150 jobs through each month. So, here’s the concept: Everything that determines success in a body shop comes down to one thing—work in progress, or as it’s referred to in trendy buzzword speak, WIP. WIP is the most critical key performance indicator (KPI) of the modern repair industry, according to a slew of successful shop owners now dedicated to Theory of Constraints operations. Sjolseth is among this group, and they are all determined to eliminate bottlenecks slowing down their shops by creating production systems that keep the correct amount of WIP on the shop floor at all times. In theory, there would be no idle vehicles, no idle technicians, and no idling whatsoever. And, now, they say, there’s a piece of technology that can get them there: gas catalytic drying. Often referred to as “robotic drying,” gas catalytic technology already is prevalent in Europe, Asia and Australia, the results of which have been well documented in recent years. Drying times for paint, primer and filler are dramatically reduced (paint directly under the device can cure in less than one minute; a font-end job on a medium-sized vehicle can dry within 6–7 minutes); efficiency and productivity in shops have increased. In 2014, the technology finally came stateside with two shops—one in Portland, Ore., and the other in Waukesha, Wis.—becoming the first American businesses to install the equipment. 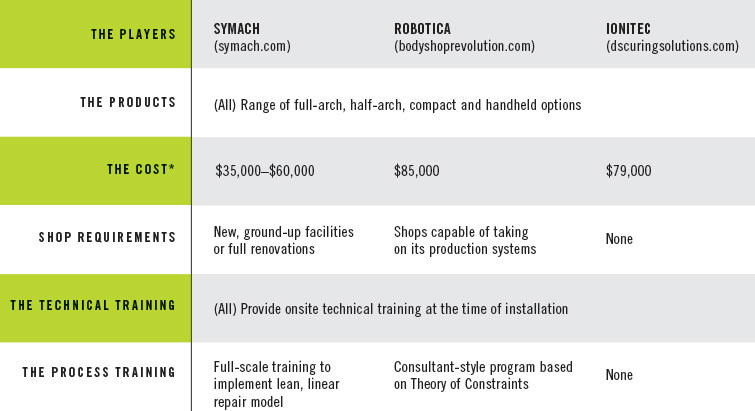 Three major providers of full-arch robotic systems are now approved for distribution in the U.S.: Ionitec, Symach and Robotica are all lining up for an arms race for market share. And shops like Sjolseth’s are lining up to be early adopters. Superior Service Center began using the technology in late January. Gas catalytic drying is made possible through an exothermic chemical reaction created by turning methane gas into infrared energy that can rapidly dry and cure paint, primer and filler. Fortunately, though, using the technology in a shop is a little less complex. All three companies provide devices in three different forms (with some variations): A complete robotic arch mounted to a track on the ceiling of a paint booth, which passses over a vehicle at roughly three feet per second; a half-arch model, designed primarily for prep bays, that also travels on a mounted ceiling track and can be maneuvered to directly hit specific areas of vehicles; and a handheld version for smaller jobs. The full arch models are fully computer-operated robotic systems with touchscreen controls. The devices need a simple electrical and natural gas hookup to be operational, and, according to Symach CEO Osvaldo Bergaglio, together make up a unique opportunity when used in one, comprehensive repair process. The system passes natural methane gas through an aluminum catalyst, which then separates the carbon and hydrogen atoms to create energy. That energy is then passed through the front of the catalyst where it mixes with oxygen; the oxygen combines with carbon molecules to create CO2 and with hydrogen to make H2O. The end result is infrared energy that is emitted out of the device. Doug Verdier co-founded D&S Curing Solutions in Portland, Ore., in order to be the first U.S. distributor of the Ionitec products. He installed the company’s robotic arch model in his shop, Active Auto Body, as a show piece for sales. That was on Oct. 2, making Active Auto Body the first shop in the U.S. to have an operational robotic drying system. Aaron Marshall, a renowned lean operations guru and FenderBender columnist, put in Robotica’s system later that month at his shop, Marshall Auto Body in Waukesha, Wis., which made Marshall the first shop operator to independently adopt the technology. Symach was the first to the space, marketing its first robotic drying product in Europe in 2001. It started with a focus on paint drying, then moved into body filler and primer. Symach sold 2,000 units in Australia and Europe in 2001, and it has grown exponentially since, working with some of the largest MSOs from the U.K. to Spain to Saudi Arabia. Both Robotica and Ionitec have picked up steam as well. Ionitec has major corporate accounts, such as the prestigious McLaren Formula 1 team. Robotica is now aligned with Bodyshop Revolution North America, which uses the technology as a tool for its Theory of Constraints-focused production model. All three companies have obtained their UL certification, and all are now available in the U.S.
And Robotica has an early lead. Aside from Marshall, four other well-known shops have opted to partner with Bodyshop Revolution and implement Robotica drying equipment—Sjolseth’s Superior Service Center; 12-shop Keenan Auto Body in the greater Philadelphia area; eight-shop LaMettry’s Collision in greater Minneapolis; and dealer-owned Rydell Collision Center in Grand Forks, N.D. And Bodyshop Revolution managing director and CEO Jon Parker says the company has roughly 15 more accounts to be announced in the coming months. Bergaglio says Symach, which just made its products available in North America on Feb. 1, also will have announcements of various partnerships in the near future. *Costs are estimates for each company’s full-arch system and can vary greatly depending on make, model and facility needs. Costs include track. Global Finishing Solutions (GFS) also has a similar product available. The GFS REVO System uses short-wave electric infrared technology to quickly dry paint, primer and filler. It’s available in several models, including a semi-automatic, half-arch system; a two-cartridge, rail-mounted or mobile system; a single-cartridge mobile system; and a handheld mobile system. FenderBender received a demonstration of the system at SEMA as part of its FenderBender Live coverage. Amberson selected Robotica because of the Bodyshop Revolution process of production. The company not only installs the equipment, but also implements its lean production model. And make no mistake: Operational changes are required in order to get results from the drying equipment. Here comes that acronym again: WIP. That is the foundation for this entire approach, whether using the Bodyshop Revolution or Symach process. Sattler says it begins with a thorough vehicle damage assessment upon the initial estimate—full blueprinting and 100 percent parts orders—and then proper scheduling to allow each vehicle to go through the shop entirely without any downtime. The lack of waiting for paint, primer and filler to dry means the vehicle can be worked on in a virtually continuous fashion. If there is a supplement or issue, which should be rare, that vehicle gets pulled from the cycle. Bergaglio says far too often, these questions aren’t answered by shops before making large equipment purchases. “You can buy the best equipment in the world, but it’s about the process and proper layout and everything else that goes into it,” Bergaglio adds. That’s why Bergaglio says Symach is looking into working with large MSOs and new or renovated facilities to eliminate physical, cultural or procedural constraints. Bodyshop Revolution, which is in the process of opening its own full-scale shop as a training center in San Diego, will work with retrofits and adapt its model to the client’s restraints. Bergaglio is quick to point out that this technology is not for everyone. First off, it’s expensive—very expensive. Also, the desired results will only be apparent in shops that already have high volumes and experience bottlenecks in their process. Still, as the industry gets smaller, many feel this is the way shops need to move to stay relevant. “It’s one of those things, like aluminum work, where a lot of people will want to sit on the sidelines and see what happens first,” Amberson says. Both Amberson and Mike LeVasseur of Keenan Auto Body say they are first implementing the processes and equipment in one location as a test run, and then will reassess as to whether they will add it in others. Verdier has the one robotic arch system in his facility, and is looking to add more Ionitec products in the near future. Sattler, Marshall and Sjolseth are each all in on the concept. Sattler says the shop has purchased five robotic systems—two full arches for his paint booths and three half arches for to cover his prep bays—and one handheld device. The total bill, including training, support and installation, will approach $600,000. It’s an extreme investment, but Sattler says the energy savings from not firing up a spray booth all day for drying, will nearly be a wash with his shop’s monthly payments for the system. And that doesn’t account for the expected increase in production. Sjolseth says he aims “to double our overall production.” He put in one full arch and one half arch, which will be able to move through his six-bay prep area. He also has two handhelds. While he wished not to discuss the total investment (“It just varies too much from shop to shop to give a clear picture”), he says the return could be swift if production fills up—and if all that waiting goes away.